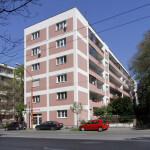 Development of modern architecture in Slovakia is connected with the times of the First Czechoslovak Republic and with the complete modernisation of the Slovak society. At that time, steel constructions, smooth white facades, hanging glass facades and flat roofs were used in Slovak architecture for the first time. Modern architecture advanced very slowly at first in the relatively conservative Slovak environment. As a result, the building of the Slovak Art Forum (A. Balán, J. Grossmann, 1925) can be seen as a change. This quite small exhibition pavilion had the basic features of the new functionalist architecture – an architecture which stressed that the design of a building should be based on the purpose of the building, that it should have a simple form and use the newest technological as well as structural possibilities. Modern architecture began to spread considerably in Slovakia only from 1930. In that year, many outstanding buildings that became models for local architecture were built. Probably the most revolutionary building for the locals was the Municipal Savings Bank in Bratislava (J. Tvarožek, 1931). 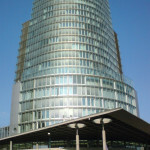 The then critics perceived its hanging glass facade as a symbol of the modernisation. During the interwar period, functionalist architecture dealt with two big topics: housing and the health service. It was these topics that encouraged the building of the most remarkable architectural works. The residential architecture equally comprised the issues of the smallest flats for economically weaker sections as well as exclusive villas for the richest. One of the first attempts to build dignified housing for the poor was the creation of the housing complex Unitas in Bratislava (1932). The architects Friedrich Weinwurm and Ignác Vécsei designed it as seven modern objects in a row estate and initially, they also devised built-in furniture. Only a year later, the same architects designed a housing complex with a characteristic name – Nová Doba (New Time) Estate (1933 – 1942). This complex also brought some architectural and building innovations. Nová Doba Estate was the first residential building in Slovakia with a steel frame. However, it was eventually used only in the first block of flats. Another new feature was a house equipped with central heating, cold and warm running water and sanitation, which was in every flat. Here the architects Weinwurm and Vécsei successfully perfected their concept of small and at the same time comfortable housing. The functionalist ideas of layout arrangement and materials of the modern housing were applied in the architecture of luxurious modern villas. The most remarkable ones are the villa of the lawyer Arpád Lengyel (F. Weinwurm, I. Vécsei, 1929), the villa of the lawyer Jaroslav Dvořák (J. Merganc, 1934) in Bratislava, as well as the villa of the doctor Viktor Mokrý in Topoľčany (E. Rosenberg, 1935). All these buildings are typical for their large rooms, open living spaces, interconnection between interior and exterior, and usage of fine materials with precise details. The extensive construction of medical facilities in the interwar period was connected with the need to cure a widely spread tuberculosis on the one hand, and with the strong belief that health care is an inevitable part of modern life on the other. That is the reason why a lot of sanatoria, medical institutions and hospitals were built. One of the most architecturally remarkable buildings is the Sanatorium Machnáč in Trenčianske Teplice (1933). It was designed by Jaromír Krejcar, the key personality of the Czechoslovak functionalism. The building was a composition of two parts – guest rooms and common rooms. Their structure resembles the aesthetics of the ocean liners that was very popular with the architects of that time. A notable counterpart of this building is the outdoor swimming pool called Zelená žaba (Green Frog) built in 1938, situated on the opposite hillock of the spa. It was designed by another important representative of the modern Czechoslovak architecture – Bohuslav Fuchs. The swimming pool perfectly fits into the natural scenery and illustrates an organic approach to modern architecture, which is less common in our territory. 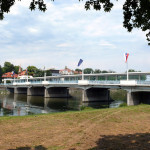 Thanks to the healthcare and the development of the spas, the artistically most convincing work of the Slovak functionalism was built – the Colonnade Bridge in Piešťany (1933). The covered bridge connects the town to the Spa Island. 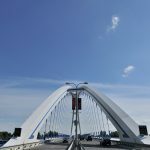 It is a combination of a difficult structural design, an impressive styling and a unique bridge construction in Slovakia. It was designed by Emil Belluš (1899 – 1979), who is usually considered the most significant Slovak architect of the interwar period. The building boom in the interwar period where Functionalist architecture blossomed and influenced the appearance of almost all Slovak towns. New streets, squares, even quarters were established. Many new schools, post offices, banks, blocks of flats and factories were built in various geometric shapes, with rich interior concepts and with a fantastic craftsmanship. These works laid the foundations of modern architectural culture in Slovakia. The avant-garde blossoming of the 1930s architecture in Slovakia was cut off by the events of the Second World War. The views on architecture became more conservative. Gable roofs as well as traditional historical elements were used again, e.g. portals, mouldings, massive stone facings or figurations. This view, typical for totalitarian societies, appeared after the Second World War as well, in the 1950s in the form of socialist realism. However, it did not last long. 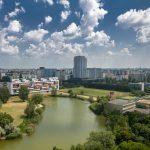 At the end of the 1950s, the idea of modern architecture prevailed in Slovakia once again, although it was quite different from the pre-war functionalism. The Late-Modern Architecture, as this movement is usually called, was characterised by extreme abstraction, complex interior concepts, massive volumes and difficult construction and technological solutions. Slovak architecture significantly developed especially in the 1960s, when the whole society experienced a revival that eventually led to the Prague Spring. It was the big building projects of this period that enabled the architects to use their imagination and new technological possibilities at full capacity. The trend was set by the graduates of the first Slovak architecture school founded in Bratislava in 1946; Vladimír Dedeček, Dušan Kuzma, Ivan Matušík, Ferdinand Milučký and Štefan Svetko. One of the first buildings that used the principles of modernism in Slovak architecture anew was the Slovak University of Agriculture in Nitra (V. Dedeček, R. Miňovský, 1965). The construction of the campus was part of a broad programme for the post-war restoration of education. Thanks to this programme, many remarkable architectural works were built. The campus situated on the bank of the river Nitra consists of pavilion buildings. Its compositional as well as functional top is a bold construction of the university hall. This dome shell made of reinforced concrete belongs to the most sophisticated and the most beautiful constructions of the Slovak modernism. An iconic example of the 1960s architecture is the Museum of Slovak National Uprising in Banská Bystrica (D. Kuzma in collaboration with J. Jankovič, 1968). A massive dramatically shaped shell made of reinforced concrete with a counterpoint in the form of the statuary called “Victims Warn Us” is an architectural work as well as a work of art. It illustrates the ambitions of modern architecture to respond to deeper philosophical impulses. A brave and sophisticated construction was the basis for another significant building of Slovak Late modernism – the Slovak Radio building (Š. Svetko, B. Kissling, Š. Ďurkovič, 1983). The steel construction of an inverted pyramid is a unique example of technological architecture in Slovakia. The arrangement of rooms inside the pyramid is also very remarkable; it is a complex autonomous world of offices. A notable part of late-modernist architecture in Slovakia was the trend of connecting principles of modern abstraction with the uniqueness of the place and the country. Its most significant representative is the Crematorium and Urn Grove in Bratislava (F. Milučký, 1968), often described as the best work of modern architecture in Slovakia. The architect used a perfect abstraction of visual arts and made a composition of parallel walls that together with the surrounding nature creates a unique frame to this place of reverence. For the whole 20th century, the effort to give everybody dignified housing was an important part of the modernist agenda. The Communist regime of the former Czechoslovakia adopted it as well. Indeed, thousands of flats were built from the 1950s to the 1980s in Slovakia. However, an insufficient economic base meant that only panel technology was used for building of the housing constructions and that there was a lack of public amenities available. Because of that, these housing estates were later perceived negatively. Post-war housing construction began with the housing estate in Račianska Street in Bratislava (Š. Svetko, O. Dukát, Š. Ďurkovič, M. Krukovská, E. Vician, V. Houdek, 1961) which is still considered to be the best example of modern housing estate in our territory. Although Slovak modernism was harshly criticised in the 1980s for being too abstract and inhumane, its basic principles have endured up to the 21st century and even today, they remain an important part of the architectural discussion. However, the architects use these time-proven models on a different content level as well as on material level. Interest in innovative technologies and a characteristic modernist combination of the vertical with the horizontal can be found e.g. on the building of the National Bank of Slovakia in Bratislava (M. Kusý, P. Paňák, 2002). On the other hand, a distinctive figurative composition can be found on the Roman Catholic Pastoral Centre in Bratislava (Ľ. Závodný, M. Siebert, G. Bliznakov, 2000). Even the rich tradition of modern housing still continues; it is proven by the many successful constructions of housing estates – e.g. the housing complex Rozadol in Bratislava (P. Moravčík, J. Šujan, 2006) and the social housing CMYK in Prešov (I. Eristavi, M. Jančok, 2005).